O_O. . HD Wallpaper and background images in the Happy درخت دوستوں club tagged: happy tree friends flippy flaky splendid. Ok. 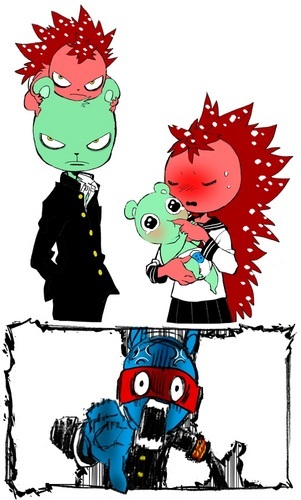 So baby flaky is on flippy's head, baby flippy is sucking on flaky's finger, and splendid is like ,WTF?! lol Flippy and Flaky had kids, and the Flaky girl is a psycho like Flippy while the Flippy boy is a crybaby like Flaky.